Ahead of his 'PILLS' art exhibition launching this Friday in Brighton we caught up with James Woodley from Prescription Art, to get some musical insight into his past and to get us in the mood for the weekend. More info on the launch can be found on Facebook - Friday 13 March, 6pm at Prescription art, 1 Beaconsfield Parade, Beaconsfield Road, Brighton. 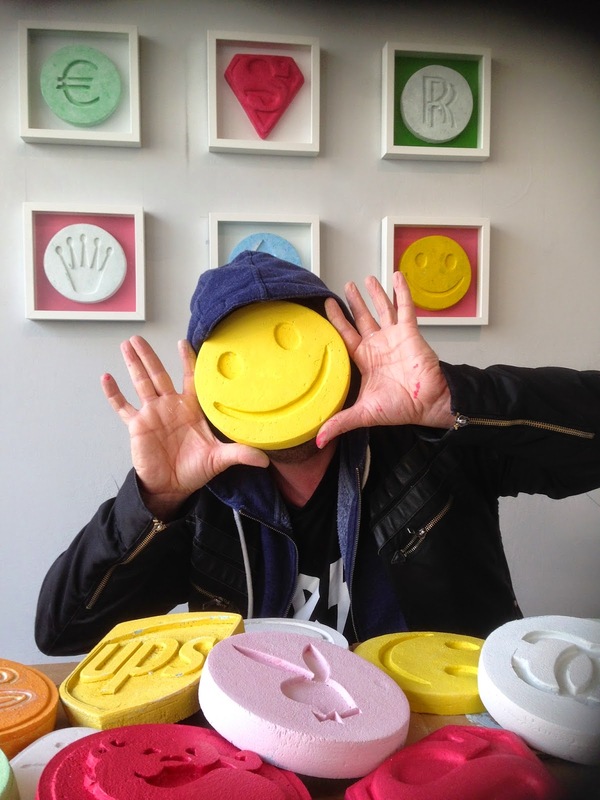 Following on from recent ‘sweet art’ works, ‘Pills’ will consist of a wall of oversized ecstasy tablets, each with their own distinctive – and authentic – branding. ‘Pills’ explores how adults continue to eat branded sweets – however this time they are looking for a stronger rush than sugar. 'As a retired music blogger I thought I’d enjoy writing a post to celebrate our forthcoming ‘Pills’ exhibition at Prescription Art… though having not done anything like this for some years it’s now proving a little bit like trying to snowboard after many years off the mountain. Considering the ‘Ecstasy’ theme of the exhibition, I thought I’d try and pick out five tracks that most defined the drug in my eyes (and ears). It seems likely that they’ll all be a nostalgic hark back to more innocent and less cynical times… but let’s face it the drugs and clubs were better! I would like to have done a nice old skool mix, but we’re busy making pills and time is tight! The obvious first choice here would be ‘Energy Flash’ by Joey Beltram… however since everyone knows that one, I thought I’d pick out a similar sounding track that for me always sat closely alongside it – ‘Substance Abuse’ by Ritchie Hawtin as F.U.S.E. I bought Substance Abuse while at University in Leeds. My first ever proper night out clubbing was at the legendary techno night The Orbit in a small town called Morley… when Underworld played live – including what must have been a 25 minute version of Rez - and Derrick May got a taxi from Heathrow to play for the last half hour of the night. After that I never looked back. The atmosphere in the Orbit was incredible, and the crowd knew exactly what they liked & wanted. Techno. The residents from the Orbit ran a record shop in Leeds… a treasure trove of shinkwrapped imports from Detroit… and Substance Abuse was one of the tracks I bought on sight having had the hairs on my neck stand up in the club. At that time the undisputed anthem of the club was ‘Access’ by DJ Misjah & DJ Tim. I’ve listened to it a few times since, and I just can’t imagine playing it out again. It lacks the sophistication & funk of all the great techno tracks that have really stood the test of time. However since I’m writing from personal experience rather than as some music journalist’s ‘greatest 100 dance records’ perspective, this will always transport me back to the middle of the dancefloor in Morley, with a stranger massaging your soldiers and 20 people hanging from the camouflage nets pumping their fists. I guess a lot of great dance records exist quite happily outside the club… but maybe this is one that was just built for being in the middle of a ferocious sound system with 500 other people absolutely off their nut. Of course raving in the 90s wasn’t just about techno. Wherever there was a field, a massive tent, and a soundsystem you were likely to hear some piano breakdowns! Get those arms up in the lasers! It’s been tough to think of a specific track, but one that sticks in my mind is Moby at Glastonbury in what must have been (through a bit of googling) 1998. This was I think the first time Glastonbury had a dance tent… whereas previously the raves had popped up on the outskirts of the site & in the market areas through the night. Having been to Glastonbury many times, it is rather hard to locate specific memories.. however I will always remember that Moby set, and in particular ‘Feeling So Real’ (here reprised in 2003) – which almost seems the musical embodiment of an ecstasy rush. After the rush comes the sunrise…. maybe this is a bit of an obvious selection – but without doubt part of being high is being there as the sun comes up, with faces coming into focus and reality making its unwelcome presence felt.